I’m constantly surprised by how many executive job seekers still haven’t fully embraced LinkedIn for job search and career management. Sure, they all at least have a presence on LinkedIn . . . usually a minimal profile with job titles and educational background. But too many of them have very little content in the many profile sections LinkedIn provides. Your LinkedIn Profile is an ideal place to build and communicate your personal brand and unique value to your target employers. But you need plenty of brand-reinforcing content to accomplish that. An incomplete profile and lack of activity on LinkedIn can mark you as a poor-fit candidate. You appear to be out-of-date with the new world of work, and not social media-savvy. Both of these can contribute to the ageism factor — a major challenge for executive job seekers over 50. You don’t want to be out of the running, before you’ve even been considered. Perhaps even more importantly, plenty of keyword-rich content is what drives LinkedIn’s search engine to push your profile to the top of results when executive recruiters and hiring decision makers search for candidates using those relevant keywords. Many of your competitors – for the jobs you want, at the companies you want – know this, and have worked hard to fully develop their profiles. Just to keep pace with them, you need to do the same . . . even if you do no more with LinkedIn than passively sit there with a complete profile. 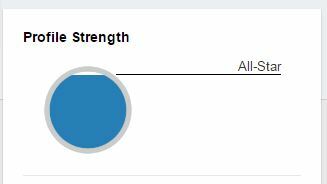 You can measure your progress towards a complete LinkedIn profile by viewing the “Profile Strength” indicator at the top of the right column, on your “Profile Edit” page. If your profile shows “All-Star” – like the graphic above – you’ve met all the requirements. Thank you for explaining what makes an effective Linkedin profile. It’s a learned skill we all have to do to succeed. Beth, I’m so glad my post was helpful. You’ve made an important point. We all do need to get busy on LinkedIn, whether or not we’re actively job-hunting. Thanks for commenting!